At Florence RSD we are proud to have received the following recognition for our contributions to the Florence Community. In 2004, FRSD was the 1st Place recipient of the EPA’s Region V. Clean Water Act Award of Excellence for Outstanding Operation & Maintenance in the Small Advance Category. As the recipients of such an award, the FRSD was presented with the “Special Achievement Award” from the Indiana Department of Environmental Management. 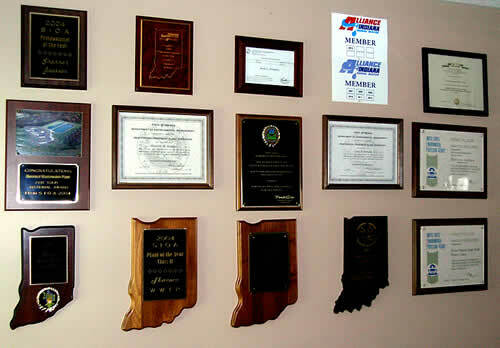 In 2001, 2004 and 2010, then again in 2012, the FRSD was awarded the Class II “Plant of the Year” by the Southern Indiana Operator’s Association. Shannon Jackson – Superintendent was presented with the 2004 “Wastewater Operator of the Year” award from the Alliance of Indiana Rural Water Association, as well as “Professional of the Year” by the Southern Indiana Operator’s Association. Ronda Humphrey – Operations Manager – was awarded the 2016 “Professional of the Year” by the Southern Indiana Operator’s Association.